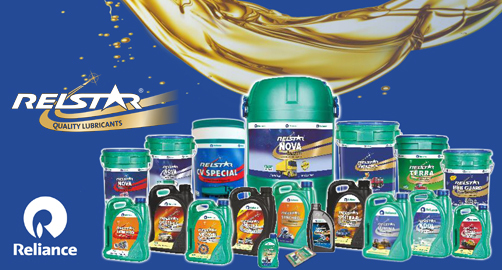 RELSTAR Lubricants is a premium quality, next generation engine oil. With a wide portfolio of 40 high performance products being offered across 13 segments ranging from automotive to industrial lubricant oils, we cater to the needs of the next generation India with advance formulated Lubricant Oil. With an extensive dealer/ distribution network in bazaar trade backed by a presence in more than 1200 plus fuel station across India, Relstar Lubricants are easily available for our customers. Our Lubricants are manufactured at a world class ISO 9001:2008 & ISO 14001 certified plant to provide premium quality engine oil at affordable prices. Recommended for use in all types of commercial vehicles, MUVs (Multi Utility Vehicles) & SUVs (Sports Utility Vehicles), tractors, off highway equipment used in construction, mining & agriculture and generator sets operating on high speed diesel fuel. Recommended for use in gear boxes and differential gear boxes of commercial vehicles, tractors, SUVs (Sports Utility Vehicles), MUVs (Multi Utility Vehicles) and passenger cars. Recommended for use in wheel bearings of commercial vehicles, tractors, SUVs, MUVs & passenger cars. Recommended for use in Steel mills, paper mills, cement plants, Heavy structural construction / fabrication industries, mining and automotive industries. Recommended for use in passenger cars & SUVs operating on diesel fuel. Recommended for use in passenger cars operating on Petrol, LPG & CNG fuels. Recommended for use in all the latest generation high output passenger cars, SUVs operating on petrol & diesel fuels. Recommended for use in all 4 stroke motorcycles with wet clutch. Recommended for use in all 4 stroke scooters. Recommended for use in hydraulic systems of mobile construction equipment, cranes and industrial machineries, fitted with a wide variety of pumps operating under moderate to heavy duty conditions. Recommended for use in all heavy duty enclosed gear drives with circulation or splash lubrication system, operating under moderate to heavy or shock load conditions in Steel, Textile and all other manufacturing companies. Recommended for use in radiators of commercial vehicles, MUVs, SUVs, passenger cars, tractors and off highway equipment. Recommended for use in all 2 stroke two wheelers and three wheelers with pre-mix and side tank lubrication system. Relstar products are manufactured from highly refined and premium quality base oil, using advanced additive formulations sourced from globally renowned additive manufacturers. Every production batch of Relstar undergoes a stringent quality control test following internationally accepted standard operating procedures such as the ASTM (American Society for Testing & Materials) standards. Our products exceed the latest performance requirements of all major Indian, American, European, and Japanese OEMs. We offer competitive pricing along with our unique Relstar Relationship Program for mechanics and other exciting trade schemes for dealers. Our Lubricants are available in user friendly and easy to handle containers. RELSTAR is part of Reliance Petro Marketing Ltd., which is a subsidiary of Reliance Industries Ltd.